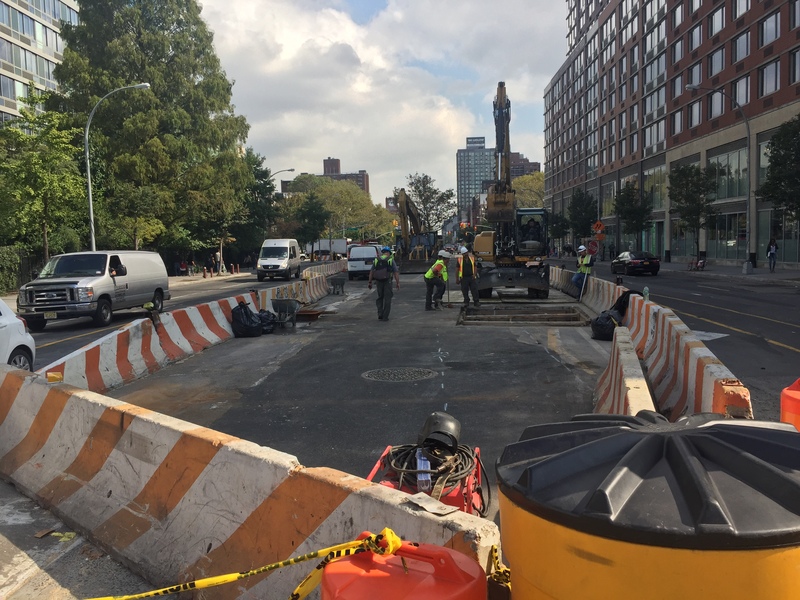 The long-delayed reconstruction of East Houston Street between the Bowery and the FDR Drive is starting to round into form. 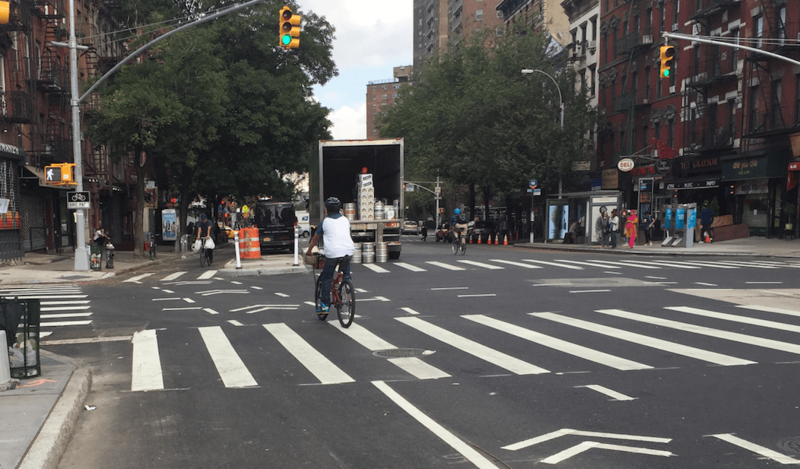 Though the Department of Design and Construction won’t wrap up the project until next year at the earliest, new medians and pedestrian areas between Avenue A and Chrystie Street are finally complete, and the transition to the First Avenue bike lane is no longer obstructed by construction. Planning for the project began all the way back in the early 2000s, and it shows. 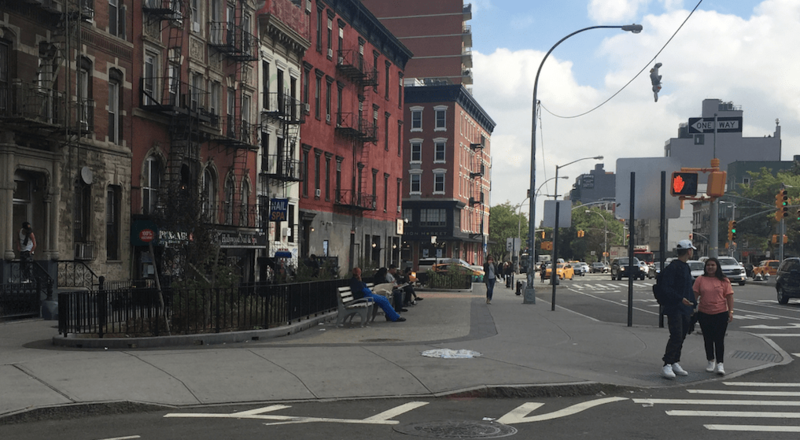 While the East Houston reconstruction includes bigger pedestrian zones and buffered bike lanes — a net improvement — it also dates to an earlier era of city street design, before protected bike lanes and plazas were common elements in DOT’s toolkit. When construction began in 2010, it was set to finish by 2013. Six years later, the end is only now in sight. 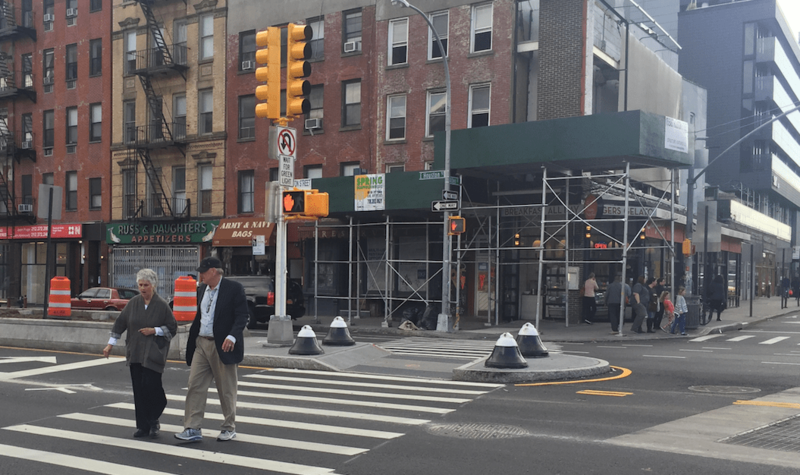 East of Chrystie Street, wider medians that will be planted with trees have been completed along the corridor. At Avenue A, a wider sidewalk and seating area was also recently finished by Punjabi Deli. For some reason, the city placed a fenced-off planted area between the ground floor stores and the seating area, an awkward barrier. One block to the west, cyclists can bike from Allen Street directly to the First Avenue bike lane again, without having to mix it up with traffic, now that the bike lane is no longer a construction staging area. 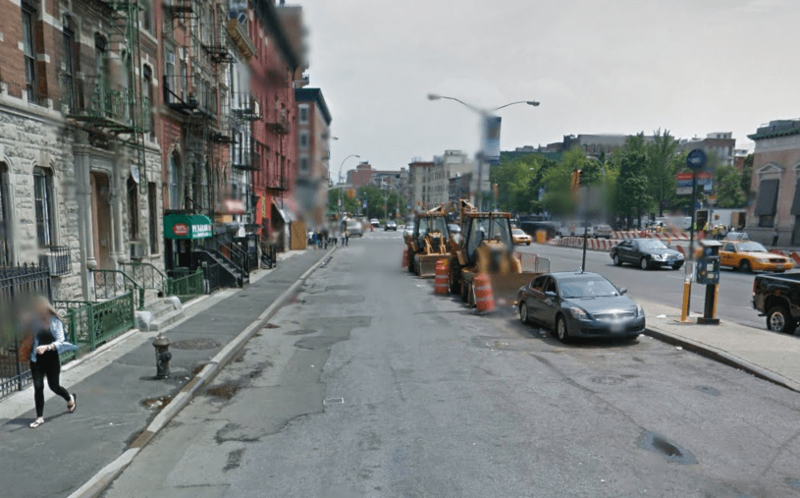 Giant construction zones remain at the Bowery and Chrystie Street/2nd Avenue. DDC has said construction will be completed next year. That transition between Allen and 1st Ave doesn’t look protected? Also did the south side of the intersection get a split phase or is the bike lane still to the right of the left turn lane? DDC is building out an ancient design in 2016. There are no post-2007 ideas in this project. Another reason to have flexible designs before solidifying them in concrete for another 50 years. DDC takes an eternity to build these out. 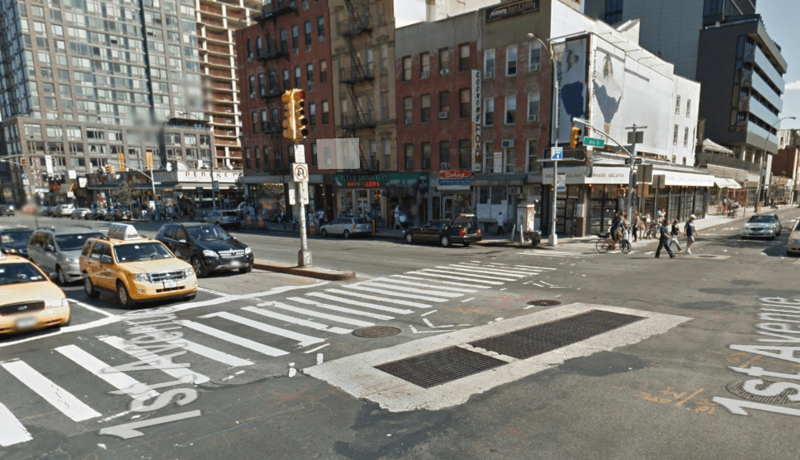 Too bad Iris Weinshall shot down protected bike lanes on Houston Street, despite a major push for them. Her legacy in NYC is abysmal. Is there a reason why the pedestrian crossing area of the concrete medians are always made narrower than the width of the crosswalks? They’re always too narrow. Wait, I thought 2nd Ave/Houston was going to be done soon? Next year? Does anyone have a link to timeframes for projects like this? It might be to discourage cars from driving into them, but a bollard in the center would do the same thing. 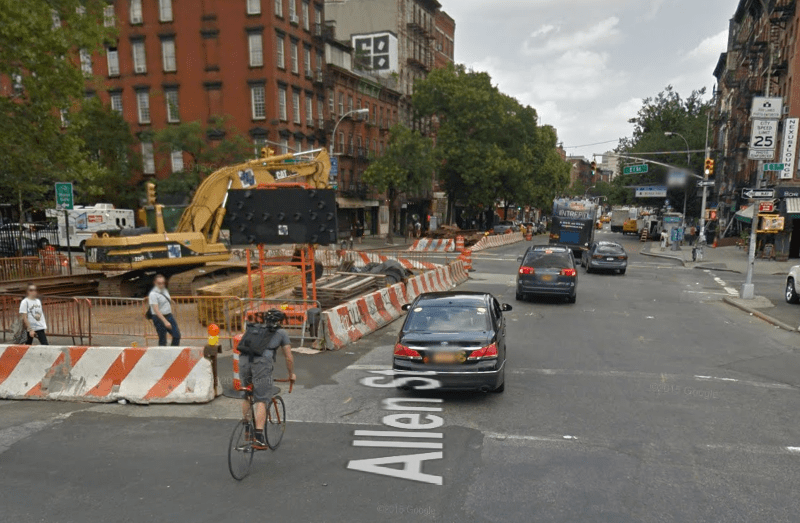 So many cyclists and pedestrians have died on Houston street in the last decade, before and during and because of this construction. May they rest in peace. They did finish 34th! Or much of it. They milled the street east of 2nd Ave., which bode well, but I was expecting the usual weeks it takes them to finally put down asphalt. Just this morning, I was braced for an unpaved 34th St., and it’s paved! It’s glassy smooth and free and clear of construction. They still have to pave the intersection at 2nd Ave.
On the other hand, the brand new asphalt on E. 4th St. off of 1st Ave. is barely hardened, but just last night I saw them digging through it again. The time it’s taken to carry out this construction is another of those city scandals we’ve become numb to. If this had been a project on private property it would have probably been completed within a year. Instead we’ve had the usual stringing out of the job, no doubt plenty of union featherbedding, and anyone with two eyes and a brain could see from daily observation that work has proceeded at a snail’s pace. The result has been hell for everyone living in the area. I used to take the M21 bus crosstown in the mornings but had to stop because it would take literally half an hour just to get to Broadway. Meanwhile we’ve had extremely treacherous conditions for cyclists and pedestrians alike. But HEY some good old AMERICAN UNION BOYS got some good overtime out of it, I’m sure. So I discovered Tuesday around 11 p.m. when I was out with the weekly group skate heading up First from Houston to the QBBr. It was very sweet, and I even yelled “It’s beautiful” at the workers as we passed through.They probably thought I was a typical crazy NYer. And…. now that that intersections done, I’ll shift my complaints up to 58th St.